Suite 91 est tout au sujet de l'emplacement et de confort. Parfait pour une famille, 2 couples, ou quelqu'un en ville pour affaires. Il est situé dans la ville historique Olde Charlottetown avec une torsion mise à jour sur la vie du centre-ville, avec la marche facile à partout où vous voulez être! Cet appartement spacieux et lumineux dispose de 2 chambres (une reine, un double), un salon joliment meublé et salle à manger et une cuisine américaine entièrement équipée avec une machine à café Keurig, four / cuisinière, micro-ondes et grand frigo. Idéalement situé à seulement minutes du front de mer, le yoga, des boutiques et de la célèbre Anne of Green Gables musicale. Profitez de la grande variété de restaurants de Charlottetown a à offrir et la zone de sécurité pour la marche. La suite dispose de la climatisation, buanderie, et un parking. Il ya un 50 "HD TV écran plat avec câble FibreOP et Wi-Fi. Faites de la Suite 91 à Weymouth votre point de départ pour explorer Charlottetown ou les plages à proximité. Lovely home with a helpful owner. This was a wonderful place to have as home base during our visit. Great location: a quiet street but a very short walk to the centre of town. Thanks! This place has everything you need for a pleasent stay in Charlottetown. It is close to the waterfront so you can enjoy your time there. The contact to LeeAnn was perfect. She also made an early check-in possible. Thank you for everything! Thank you for your review! We hope you come back again sometime. 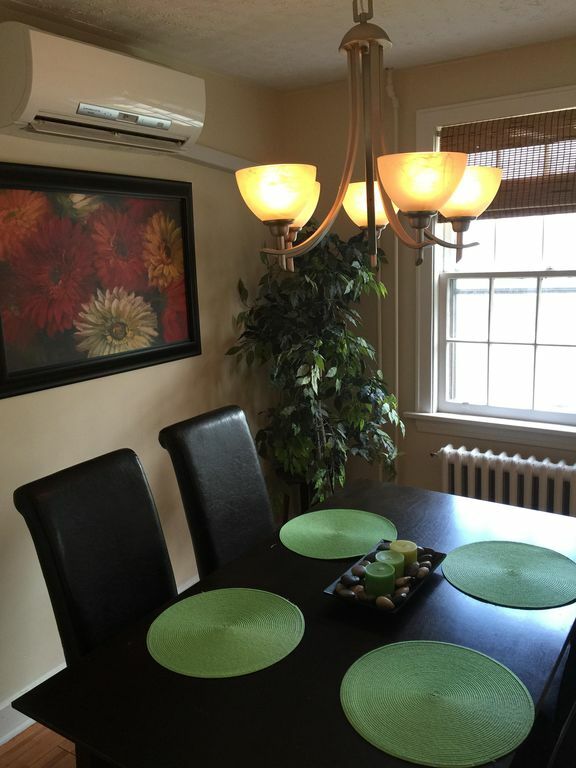 The apartment was clean and within walking distance of Charlottetown. The owner responded quickly to questions. The condo was well equipped, comfortable, and in a quiet neighborhood. I would definitely stay here again. Thanks for taking the time to write a review for us and we look forward to having you back again! Entire upper floor, kitchen, eating area, living room and 2 bedrooms perfect for 2 (or 4) people. Thank you for taking time to write a review! Please come back again! We really enjoyed the location. Great to have air conditioning and washer/dryer. The overall cleanliness was good but upon closer inspection, the kitchen dishes and bathroom cleaning could have been better. The manager of the property is great to work with. It is close to city center...about 4 blocks. Our only real complaint is that the beds were hard and not as comfortable as we would like. The bathroom is a bit small as well. The unit has everything you will need for an easy stay. Shopping advice: The best stores are a bit of a drive, but worth it. If you take Grafton St. towards town, then go right on University, in a couple of miles there is a huge mall...in that area are two large grocery stores...also a WalMart and many other stores of all kinds. Suite 91 est à seulement quelques pâtés de maisons du secteur riverain de Charlottetown. Promenez-vous ou faire un jogging du matin sur 8 km de la belle promenade sur le port de Charlottetown. Shopping, restaurants, musique live, des gymnases, des spas, et le théâtre en direct sont tous à distance de marche. Balance is due 1 week prior to arrival. Deposit is refunded if cancelled 1 month prior to arrival minus a $100 booking fee.